Treat yourself to complete ergonomic adjustability even including a fully adjustable elastic mesh head/neck rest. Top quality, heavy-duty components enable us to offer this chair a guarantee for 24/7 applications and users up to 350 lbs.! 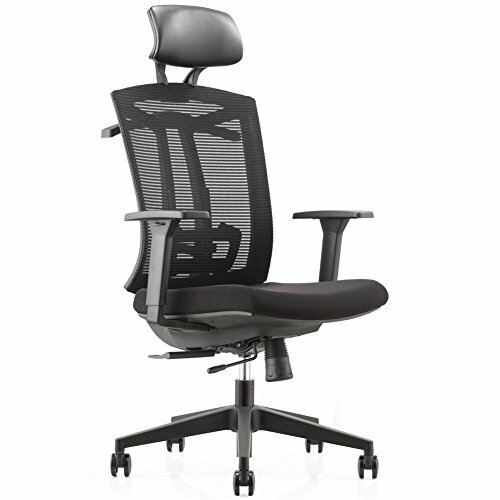 This unique design for a 24-hour chair features the finest quality elastic mesh backrest for excellent breathability and comfort. An extra thick contoured seat pad makes use of both high density foam sub layers for form and top foam layers of low density foam for a softer surface feel. The completely adjustable PU headrest not only completes the polished look of this chair, but also provides excellent head and neck support! Headrest adjusts in height, overall angle and pivot of headrest. * Overall: 27"W x 27"D x 51" - 55"H.
* Seat height range: 19-3/4" - 22-1/2"H from floor. * Armrest height: 25-1/2" - 32-1/2"H from floor. Skeletal back frame covered with high density strength mesh, which allows air circulation all year round. Nylon hanger on back to hang your suit, bags, etc. Leather headrest and extra comfort. Height adjustable T shaped Armrest with a comfortable sculptured PU pad, ensures maximum support for your arms. High density strength mesh with adjustable lumbar support hugs your lower back and enhances the natural curve of your spine. If you have any questions about this product by CMO, contact us by completing and submitting the form below. If you are looking for a specif part number, please include it with your message.